This question came up my mind when I attended Deutsche Welle Global Media Forum in Bonn, Germany, a week ago. One of the events there was BOBs (Best of Blogs) Awarding. Blog might be promising type of media in 2005-2009. But now, the quantity is declining since the netizen prefer social media as microphone for their inner voice. What a bitter fact. Do some blogwalking, you’ll agree with him. I don’t mind blogs with amateur content. They’re learning (as I am, actually). But blogs of spammer and copy-paster, to me, are very irritating. With low quality posts, they can show up on top of Google’s result page. They’re mocking Google algorithm by that. In the meantime, Google is sluggish to anticipate such blogs, especially when they come from Blogspot (Google’s very own blog platform). However, let’s not only look search engines with machinery work like Google. There are a lot of humanly appreciations for blogs out there. It’s more valuable, I think. One of them is BOBs Award I’ve just mentioned. The Deutsche Welle (DW Media) International Blog Awards honors websites in 11 languages (Arabic, Bengali, Chinese, English, French, German, Indonesian, Persian, Portuguese, Russian and Spanish) annually. It launched in 2004, when blogs were just beginning to establish themselves as a new tool in internet. The BOBs represent one of the DW ongoing efforts to promote freedom of expression and the upholding of human rights around the world. I myself was asked to attend to their annually conference in Germany, with accommodation and transportation totally from them. I never applied such honor. WarungFiksi.net wasn’t even nominated to BOBs. DW Media just observed this blog and invited me. Then, after I said yes, they sent me some 11,000 km away from Indonesia to witness this international event. Wow, I thank them so much! I believe the reason is because I have a blog that I passionately build. 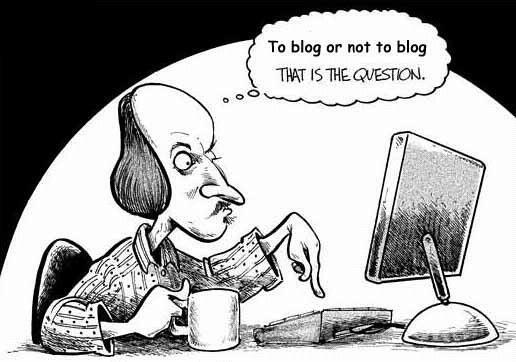 It could be happen to every (serious) blogger. Sharing. Blogging is like “CSR”. Whether you’re an author or not, you have to share expertise to your public. There is a time to take, there is a time to give. Blogging is giving. Showing your portfolio. Some clients may track your competence through your blog before dial your number. This is where you build your (personal) brand. Nurturing the community. Blog is something useful for promoting your work, meeting with your folk, receiving feedback directly, press releasing, and so on. Surely, social media can do those as well. But blog is better, exclusive, and permanent. You know, one day, Facebook will end up like Friendster, trust me. And when it happens, your photos, videos, status, notes and everything will be gone, something that won’t happen to your blog (unless you’re not paying the host). as old saying, blog is marathon not sprint. Do you blog too, Aleena? Btw, congrats yak udah ke Jerman. Doh, kapan giliran gw?? Don’t you know, my lonely nights during your “travel” support me to blog more seriously. Who knows, DW will invite me next year. Dulu waktu saya bikin personal website, yusuf.web.id, ada yang nanyakan kenapa nggak bikin blog? Saya balik tanya, apa bedanya? Kalau yang dimaksud blog adalah sistem yang sudah jadi kayak blogspot, wordpress dll, saya memang nggak nge-blog. Karena saya bikin sendiri (lebih bisa saya kustomisasi). Tapi sebenarnya yang penting adl selalu konsisten menulis. Entah di blog, diary pribadi, buku yg dijual, majalah dll. Itu yg susah. Hehehe. Btw, Brahmanto ke Jerman ta, Rie? Aleena: Yah, kok gak diterusin? Makanya tiap komen, URL webnya nggak diisi, hahaha…. Wah, keren Brahm sampai ke Jerman. Kalau saya sih sejak dulu tinggal di London (baca: Londen, kulone Nginden… Hehehe). I read your article. Very interesting insights. I will definitely think blogs over from now on.